It seems the market's consistent bid to move higher this year might be confusing the individual investor. That is, the fact the market has escaped any material pullback this year may be weighing on consumers in that they are prepared for or expect a pullback. 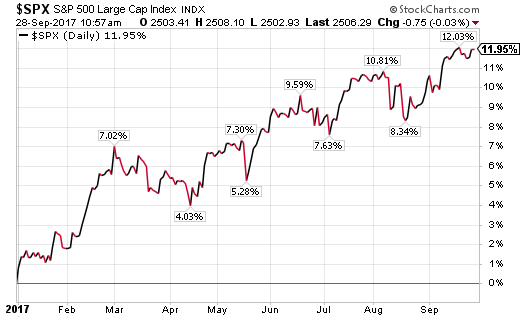 As the below chart shows, the market has avoided such a pullback of more than 3% so far this year. 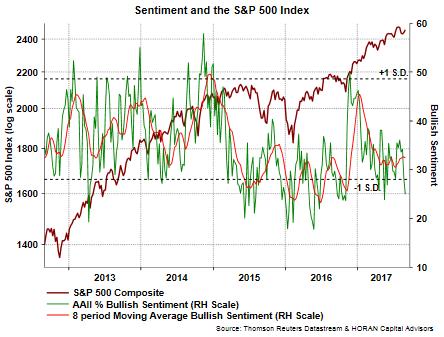 This lack of volatility has not translated into a bullish individual investors though if the American Association of Individual Investors Sentiment Survey is a guide. This week's sentiment report shows bullish sentiment declined almost seven percentage points to 33.3%. Most of this decline showed up in an increase in the neutral reading with a 5.3 percentage point increase to 37.9%. With the strength of this year's market return that actually began in February of last year, one would expect the individual investor to be bullish on equities. Remembering the sentiment reading is a contrarian one, high bullishness readings can be a negative for future equity prices. 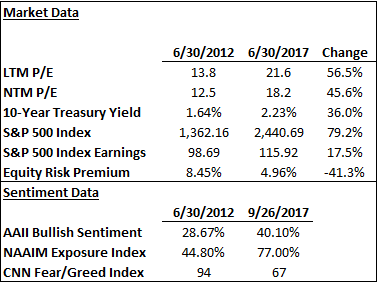 Excessive individual investor bullish is certainly not the case at the moment if the survey readings are to be believed. I was communicating with a client today who reminded me of a conversation we had five years ago almost to the day about whether or not the U.S. equity market was in a bubble. The discussion was prompted by the USA Today article, Consumer Sentiment Stat Hints that Bull Market May be Stalling Out, that highlighted a data point from the recent University of Michigan Sentiment Survey. In the survey it was noted that 65% of individuals surveyed believe stock prices rise over the next twelve months. This is a high level for the survey and a contrarian data point for stocks. The conclusion from that 2012 conversation was equities were attractive and our firm wrote as much in our third quarter 2012 newsletter. Additionally, I shared a Fidelity white paper, U.S. Equities: Light At The End Of The Tunnel. An interesting read in retrospect. Much was occurring in 2012 with the 10-year Treasury yield below 2% and the Federal Reserve providing massive monetary support (QE) to the economy, i.e., buying $40 billion of mortgage bonds each month. 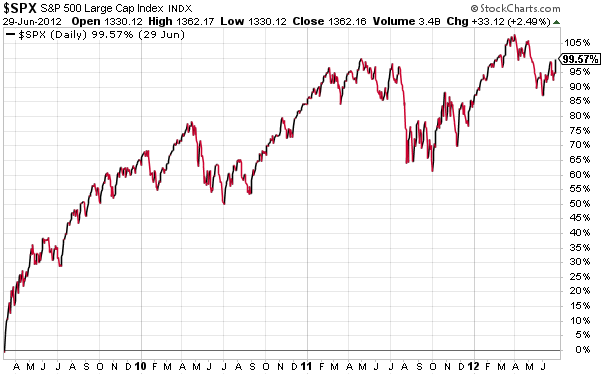 This was occurring on the back of an equity market that was up 100% from the March 2009 low to June 2012. Both print and television financial commentary at the time was intimating concern for the markets. A CNN Money article from September 2012 was titled, Stocks End Week At Multi Year Highs. In the article a link was provide to, Are Investors Getting Too Greedy which referenced CNN Money's Fear & Greed Index that was flashing an extreme Greed level of 93. Several weeks later and into the first week of October 2012, Sam Zell, Chairman of Equity Group Investments, stated in an interview on CNBC, "We're heading for a recession and that's exactly what you're looking at now." Raising the bubble question now is even more appropriate today then it was five years ago given how far the equity markets have risen over the last five years. Also, market data is decidedly different and is summarized below. Some of the data was taken from the earlier cited Fidelity white paper. If any variable in the below table jumps out at readers, it should be the higher valuation of the S&P 500 Index based on the price earnings ratio or P/E, 56.5% higher, while earnings are higher by only 17.5% during the same time period. In other words, the market advance over the last five years has largely been supported by multiple or P/E expansion. Sentiment data is also more bullish at the moment, but not at a level that has historically been associated with a bear market type downturn. 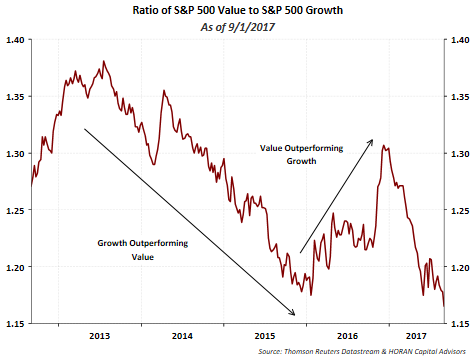 Certainly given current market valuation levels, earnings growth will be important for strong S&P 500 Index returns as we look ahead. Twelve month trailing earnings as of June 2017 does capture the energy weakness in 2012; however, when evaluating the year over year June 2017 to June 2018 estimated operating earnings growth rate for the S&P 500 Index, earnings growth is expected to equal about 18% and in line with the forward P/E. On a calendar year basis, comparing 2018 to 2017, earnings growth is expected at a respectable low double digit growth rate. In a couple of recent posts I have noted the Fed's desire to actually begin withdrawing liquidity from the market and they announced as much in last week's Fed statement with a start date beginning next month. An old adage that gets repeated around Fed accommodation changes is, 'don't fight the Fed'. Just as the Fed has been supply liquidity since the onset of the financial crisis, and this has likely had some positive impact on asset prices, withdrawing liquidity can be disrupting on the way out. We will be on guard for potential asset price volatility, but will note, historically, stocks have been positively correlated to the rate moves when they occur below 5%. 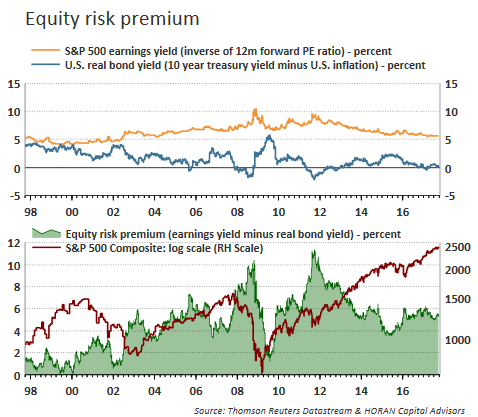 In summary, we were strongly bullish in 2012 given equity valuations and a high equity risk premium. We do not expect a recession near term, but believe today that more pressure falls on companies to generate earnings growth, which we do think is likely, but probably not a market where a rising tide raises all boats. In client accounts we have reduced some equity investments where we believe earnings growth is more challenged and taken profits in some stocks that have moved higher and gotten ahead of valuations. At the same time, we have allocated equity investments to developed and emerging international markets over the last 18-months or so. This allocation adjustment has been a positive for clients and we continue to find valuations outside the U.S attractive. "One of the lesser known intermarket principles is the inverse link between bond yields and technology stocks' relative performance...Growth stocks like technology...do better in a slower economy which is usually associated with low interest rates." "Value stocks (like banks) do better in a stronger economy with rising bond yields...Rising global bond yields could make the going tougher for technology stocks." 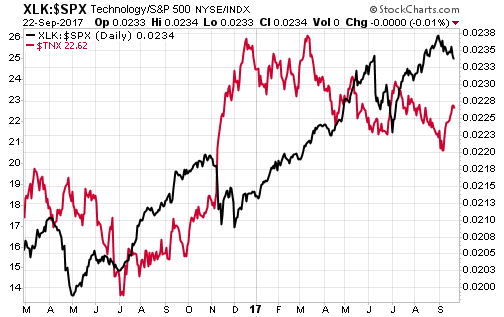 The below chart was included with his comment and shows the inverse relationship between the 10-Year Treasury yield (red line) to a ratio of the Technology SPDR (XLK) divided by the S&P 500 Index. Jon Murphy notes, "Rising rates this past month may again be contributing to tech selling, especially with a more hawkish sounding Fed. The inflationary impact of rising energy prices may also give the Fed more cover for a December rate hike." Weakness is beginning to show in some of the large cap technology stocks. 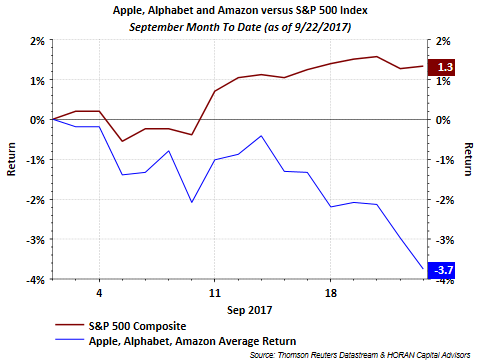 Below is a chart of the average return of Apple, Alphabet and Amazon for month to date in September. This time period is a short three weeks, but the performance of large cap technology stocks is something investors will want to follow as the last three months of the year unfold. 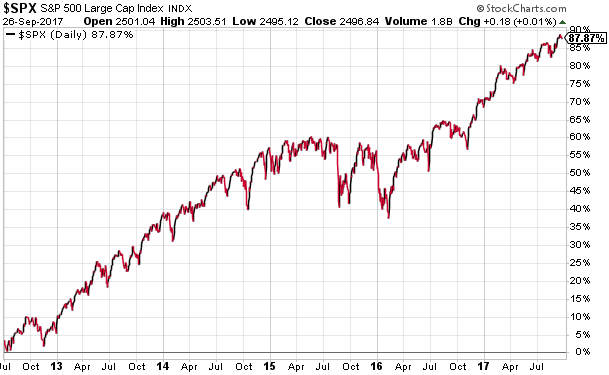 It seems a day does not go by where various strategists lament the market's valuation and lack of any significant pullback in over a year and a half. Not only are the valuations of a number of equity indices above their long term average, some might say the valuations are indicative of the speculative froth in the market. 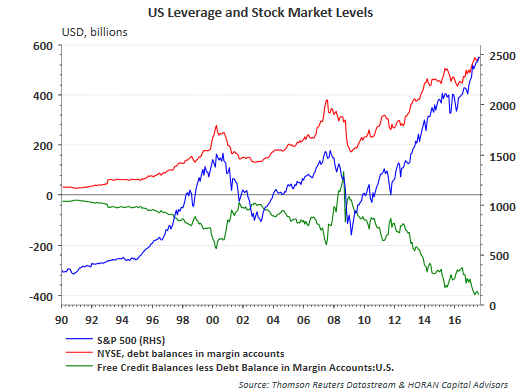 One data point highlighted is the margin debt level. Certainly margin debt has increased as can be seen in the first chart below. However, the second chart shows that margin debt as a percentage of total equity market capitalization has remained fairly stable since 2010. A good article on evaluating margin debt can be found in a MarketWatch article from a few years back, Cash vs. margin debt is the real problem for this market. The unique aspect of the current U.S equity market has been the market's desire to move higher without any significant pullback. As the below chart shows, the last correction (double digit decline) occurred in early 2016 and culminated with a 13.3% decline ending February 11, 2016. 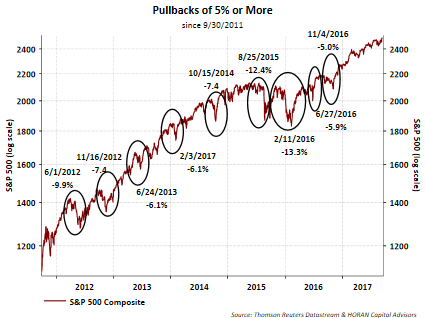 Since the February correction, two other pullbacks of around 5% occurred around June 2016 and November 2016. 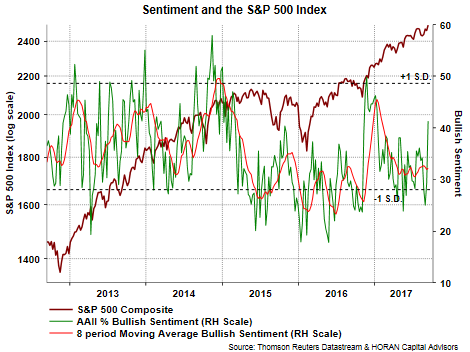 In today's Sentiment Survey release by the American Association of Individual Investors, bullish sentiment jump twelve percentage points to 41.3%. All of the increase in bullish investor sentiment come from a 13.8 percentage point drop in bearish sentiment as can be seen in the second chart below. The bull/bear spread of 19.3 is the second highest of the year following early January's 20.97 bull/bear spread. "The main proposal set out in the consultation paper is the creation of a Communication Services Sector, comprised of the current Telecommunication Services Sector, Media Industry Group, and specific companies from the Software & Services Industry Group." Sector weights in other indexes would be impacted as well with a couple of those noted below. As an example, Communications Services would increase to 13.7% from 1% in the Russell 1000 Growth Index. In the S&P 500 Index, the Information Technology sector would decline to 18.4% from the current 23.3% weighting. One style of the market that has outperformed, except in 2016, has been growth type equities. In 2016 value outperformed growth with a value outperformance burst subsequent to the election. Value's outperformance essentially ended at the beginning of this year though. As the equity market nears a record high, both institutional and individual investors continue to indicate they are less bullish. 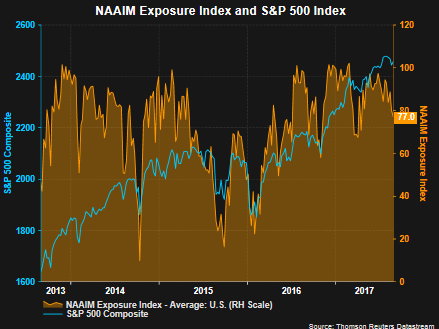 The NAAIM Exposure Index continues to decline with long equity exposure down to 77%. 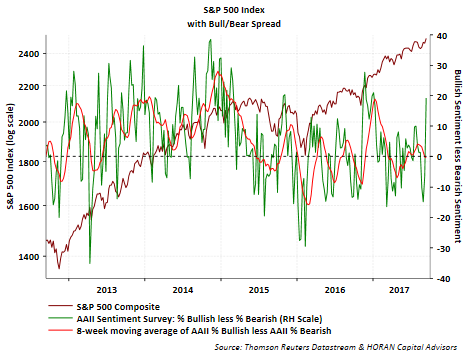 Yesterday's AAII Sentiment Survey report showed bullish sentiment fell another 3.1 percentage points to 25% and now is below the minus one standard deviation level for bullish sentiment. The market rarely rewards investors for being properly positioned for a market pullback. 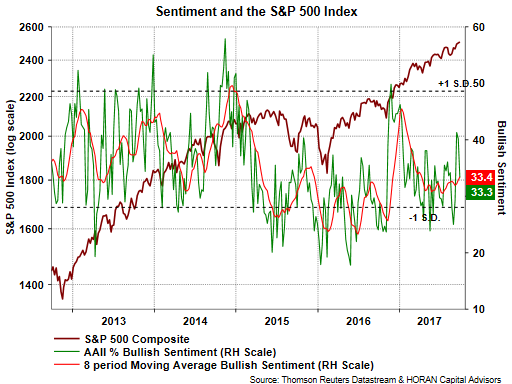 Sentiment measures are contrarian ones and by these measures only, this widespread skepticism would suggest the market might continue to move higher.